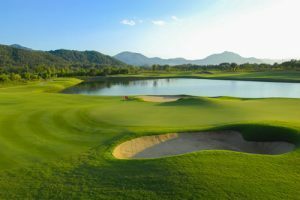 Alpine Golf Resort Chiang Mai – Northern Thailand’s Most Funky Golf Course? 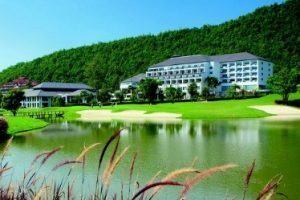 Emerging from the lush greenery like a beacon in the night, Alpine Golf Resort rests among the rolling hills outside the beautiful city of Chiang Mai. As soon as I made my first steps into the entrance hall of the hotel I was unexpectedly hit with a sense of awe as the foyer led itself to a gorgeous rocky backdrop that disappeared into a tranquil water garden teeming with vibrant colorful fish. Now, like most of you, I try to find the “wow” factor on each of my new adventures, and I was pleasantly surprised to be enthralled by Alpine Resort’s unique charm within my first few moments of arriving. With our room keys in hand, we went up for our first look at where we were sleeping. Upon entering, I noticed the size of the rooms as they were spacious which granted me a sense of warmth and comfort. After making myself at home I went to check out the balcony’s views. Even in the falling rain, the golf course laid itself out into a stunning spectacle of top class landscaping and maintenance. My anticipation was so high I could hardly wait until the next morning’s tee time. After exploring the room and taking in the sweeping views of the course on our balcony, we decided to hit the restaurant for dinner. However, having grazed our way north our dinner was fairly light as we could only focus on the coming day’s round of golf. Tomorrow would be a different story. The next morning, we proceeded to have a nice chat with the staff in order to ensure the activities we had planned for our travelers were good to go. We then made our way across to the Chiang Mai Highlands Golf Club as it is included in two of our four games during the tournament week. Now, I have had the experience of playing both courses as well as the full 27 holes at Highlands and I can say that it was a great experience to have the opportunity to play Highlands again. There are three separate 9s at Highlands, and the new 9 was incorporated and designed in such a way that it fit in seamlessly with the two others. After a good round, we decided to cool down at the clubhouse with a nice beer before heading back to hotel to clean up before our dinner. Now, after last night’s light meal, we decided to finally put hotel kitchen to the test. The menu was quite comprehensive so we decided on sharing a mixture of small plates along with icy beer amongst our small groups of 3. Next, we moved on to our main entrees. Even though I can’t say I speak for the others, my dinner was superb and I am supremely confident that everyone will enjoy the menus that we have created for the upcoming Asia Golf Week in November. The following morning, we had a quick run about the newly designed 9 at Alpine that was recently completed. To say that this was probably the funkiest golf course I have ever seen would be an understatement. Its “funkitude” was on another level along with its quality landscaping. This further fueled my motivation to give it a try. Bright and early we ventured out in the cool brisk morning at the newly constructed B & C design Alpine Golf Course. Holes 10 to 14 were in excellent condition. They used to be part of the old Alpine back 9 and gave little indication of what was to expect ahead. Next thing we know we turn the corner and seemingly step into an alien world in terms of golf course design. I was speechless. The 15th hole is especially striking as it serves as the course’s signature hole. It is a par 3 that is otherwise named the “Rice Paddies” as the green is elevated and set in the midst of a flowing field of growing rice. And, yes, they are indeed real rice paddies. While attractive to the eye they would surely turn ugly if you would have the misfortune of straying your shot too far from the green. Accuracy is considered paramount in this area as all three of us were only able to manage to hit it into the rough. Luckily, we avoided the pristine paddies surrounding us. Ultimately, three bogeys welcomed us to this fresh 9. From there on out it became a delightful voyage of discovery as we made our way through the rolling landscape from tee to green. I believe this 9 serves as a good test for golfers of any experience, and will have them coming back for more. We were so lucky to have had the opportunity to play as much as possible because I believe this course is worth more than just one round. The photos whilst good, don’t show the whole picture. There is more than meets the eye at Alpine. I wanted to stay on and hit another round but we were headed South in the early afternoon so we showered, packed up and said so long. Afterwards, we all agreed that we were looking forward to our return to Alpine in November. For full details about the Chiang Mai Golf Week click here. Our Early Bird booking offer is book and pay prior to 31 August and receive a free room upgrade.